The River Heights High Wildcats are facing their bitter rivals, Red Rocks High, in a girls’ softball play-off game. But before the first pitch is thrown, the spirit of foul play intrudes. 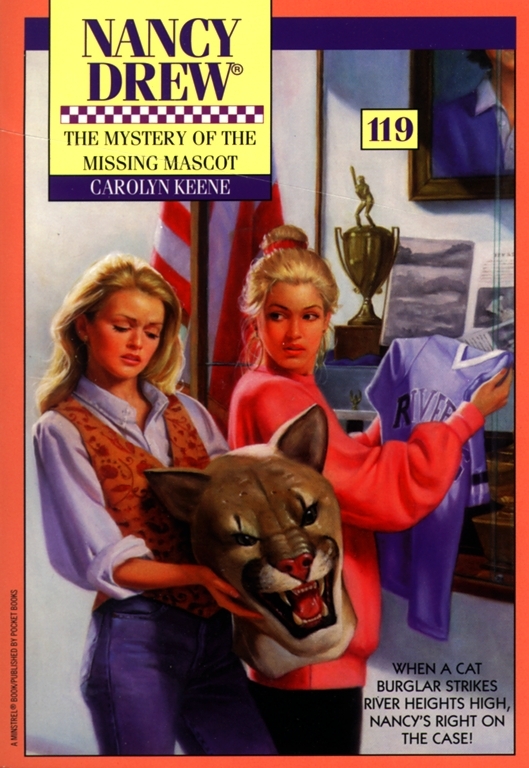 Someone breaks into River Heights High and steals the school’s prized trophies—a treasured portrait of a pioneering woman coach and the team mascot’s cougar costume! Nancy, however, is convinced that the theft is not a simple case of bad sportsmanship. For the closer she comes to the truth, the more dangerous the game becomes. The burglar has already demonstrated a talent for disguise and deception…and has now decided to play true hardball, taking aim at Nancy Drew! "Can you believe River Heights is so excited about a high school softball game?" Nancy Drew asked as she and her friend Bess Marvin walked down Main Street toward Vida's Sandwich Shop. Although it was a quiet Sunday morning and most of the shops were closed, nearly every storefront displayed the bright blue and white colors of River Heights High. The sports shop window was filled with blue and white sweatshirts, and Cody's Cameras displayed a poster-size photo of the girls' softball team. Many of the other stores had signs cheering on the River Heights Wildcats to beat Red Rocks High. Bess pushed back the visor of the blue River Heights baseball cap she was wearing. "Check out the bakery," she said in amazement. The bakery window displayed a large rectangular cake with blue and white icing. Bess read aloud the message: "Congratulations, River Heights, Eastern Conference Champions!" She turned to Nancy with a worried glance. "Don't you think they ought to wait until we actually win before baking a cake like that? Today is only the play-off game." Nancy pushed back a windblown strand of her reddish blond hair. "It does seem a little premature when we've still got two games to go. Then again, this is the first time in years River Heights has made it to the play-offs. And against Red Rocks -- our archrival!" She glanced at her watch as they reached Vida's Sandwich Shop. "It's eleven-thirty now, and the game starts at two. Do you think we'll have time to search for a birthday present for Hannah before then?" Hannah Gruen, the Drews' housekeeper, had lived with Nancy and her father ever since Nancy's mother died when Nancy was very young. Over the years she'd become family to the Drews. "No problem," Bess said. "First food, then shopping -- that's what I consider a perfect agenda." The two girls went into the sandwich shop and settled themselves in a booth near the back. Nancy ordered a salad, and Bess ordered soup and a sandwich. As the waitress left with their order, two teenage girls sat down at the counter. "They both play on the softball team," Bess whispered to Nancy. "I recognize them from when George was on the team." George Fayne was Bess's first cousin. The two cousins were almost complete opposites -- George lived for sports, Bess for clothing, food, and boys. Both were Nancy's best friends, however, and like Nancy, they had graduated from River Heights High the year before. "Isn't that Tyra Walker?" Nancy asked, nodding toward the taller girl, who had short black hair and light brown skin. "I think I remember her from last year's school play." "That's right," Bess said. "And sitting next to her is Louisa Esposito, the team pitcher. She's supposed to be amazing. I've never seen her play, but her pitches have been clocked at something like thirty-five miles an hour. Last year George kept saying that they ought to take Louisa off the junior varsity team and put her on varsity." "Why didn't they?" Nancy asked as she studied the small-boned girl with long, curly dark hair. "She was only a sophomore then," Bess explained. "And you know Coach Marks. She feels the varsity teams ought to be chosen from the upper grades." Bess frowned, concentrating. "I think I heard from someone that Louisa and Coach Marks have had a few run-ins." Nancy winced. "Is Coach Marks laying down the law again?" Coach Marks was famous for being strict with her athletes, particularly anyone who had an ego. "The team is what matters. We have no stars here," was her favorite saying. Bess shrugged. "I'm not sure what's going on. George has been away at that tennis clinic, so I haven't been getting all the sports gossip." "Why don't we go wish them luck?" Nancy suggested. The two friends went up to the counter, where Tyra and Louisa were studying the menu. "Hi, " Bess said. "Tyra, Louisa, this is my friend Nancy Drew. We just wanted to wish you luck before the game. Tyra smiled at Nancy. "Aren't you the one who solves all those mysteries?" "I try," Nancy said. Nancy was, in fact, a well-known amateur detective. But that day she was more interested in talking about the upcoming game. "How's it going?" she asked. "You two must be psyched for the game. Tyra nodded and Louisa stared at the menu. That's odd, Nancy thought. Neither one of the girls had that pregame excitement she'd seen so often in George. "Is Red Rocks really as tough as everyone says?" she asked. Neither of the girls answered. Instead, they exchanged a troubled glance. "Is something wrong?" Nancy asked, her curiosity aroused. Louisa gave a hollow laugh. "You could say that." "What is it?" Bess asked. "Is there something we can do to help?" "No one can help," Louisa answered. "I'm off the team. Off the team and out of the game." "You can't be," Bess said indignantly. "You're the reason River Heights finally made it to the play-offs. " "That's not true," Louisa said at once. "There are a lot of strong players this year." "Why were you cut?" Nancy asked. "I missed three practices," Louisa said bitterly. "My mother works nights, and my younger brother's been sick. During Thursday's practice I had to take care of him. It was my third no-show. So on Friday Coach Marks gave me the ax." "I'm sure the coach would understand -- " Nancy began. Tyra shook her head. "Coach Marks has an unbreakable rule: Miss three practices and you're out -- no excuses, no exceptions." "How could she cut the pitcher two days before the big play-off game?" Bess demanded in an outraged tone. Louisa shrugged and stood up. "Ask the coach." She turned to Tyra. "I guess I'm not hungry after all. I'll see you later. Play a good game, okay?" "Yeah," Tyra said in a dejected voice. Nancy saw the waitress bringing out the food she and Bess had ordered. "Do you want to join us at our booth?" she asked Tyra. "No, thanks," Tyra said. "I guess I'm not that hungry either. I think I'm going to go over to the school and warm up. Tyra gave her a sad smile. "With Louisa out , we're going to need more than luck. " As Tyra left the sandwich shop, Nancy and Bess returned to their booth. Bess helped herself to a slice of the hot bread that was served with her soup. "Red Rocks High has beaten our softball team every year for the last ten years," she said. "I was sure this would be our big breakthrough." Nancy glanced up at the blue and white crepe paper strung from the restaurant's ceiling. "So was everyone else in River Heights. But remember, Louisa said the whole team was strong." Bess still looked downcast, and Nancy decided to change the subject. "I need your help," she said. "Hannah's birthday is on Friday, and I don't know what to get her." Bess's blue eyes twinkled. "You've come to the right person -- shopping problems are my specialty. How about some jewelry or a nice wool sweater?" "I've gotten her those for other birthdays. You know," Nancy said thoughtfully, "Hannah loves to go to art museums and galleries. Maybe I could find her a piece of art -- a print or a sketch." "Let's try the Thompson Art Galley," Bess suggested. "It's in that wonderful old Victorian house -- I love going there. Besides, Maggie Thompson's got great taste. Just about everything in there is gorgeous. "Sounds like the place to start," Nancy agreed. After they'd finished eating and paid the check, the two girls got into Nancy's blue Mustang and set off. Nancy drove along a winding tree-lined road that led out of the center of town. The Thompson Gallery soon came into view, a big white wooden house, with a wide wrap-around veranda and gingerbread trim edging the roof. Maggie Thompson had inherited it from her grandfather and converted it into a spacious gallery. Nancy pulled into the parking lot at the back of the building, then the two friends walked around to the entrance and opened the tall door that led into the entry hall. Maggie Thompson, a slender woman with long, silver-gray hair that fell halfway down her back, was sitting at the oak reception desk at the end of the hallway. "Nancy, Bess, what a pleasant surprise!" she said. Maggie, a longtime friend of Nancy's father, Carson Drew, had known Nancy and her friends for years. According to Mr. Drew, Maggie had once been a painter herself. "Please have a look around," she told the girls. "I've got lots of wonderful new pieces." Nancy and Bess began to wander through the ground floor of the old house. The room that had once been the kitchen was hung with still lifes, painted in deep fall colors. The drawing room featured a series of landscapes. Nancy and Bess made their way into the high-ceilinged dining room that served as the main gallery. A stack of large canvases leaned against a wall. Only one painting was hung, a riveting portrait of a young man sitting on the edge of a cliff, staring across a wooded mountain valley. "Yes, he is," Maggie agreed, coming up behind them. "That's one of Burt Horenstein's. It was painted two years ago. Nancy looked at the painting with new interest. "Isn't Horenstein the artist who just died?" "That's right," Maggie said. "Horenstein is River Heights's most famous artist -- he graduated from River Heights Art Academy about twenty-five years ago. Did either of you ever meet him?" Both Nancy and Bess shook their heads. "Here, I'll show you some photographs," the gallery owner offered. She led the two girls into the study, where she took a leather-bound photo album from a shelf. "This was Horenstein at his last show," she said, pointing to a picture of a lean, bearded man wearing thick glasses. "And this" -- she turned to another photo -- "was Horenstein with some of the other students from the academy. He was about nineteen then." "Did he go to River Heights High before the academy?" Bess asked curiously. "No," Maggie answered. "The Horensteins moved to River Heights the year that Burt entered the academy." "What an outfit!" Bess giggled, pointing to the shabby tuxedo jacket that Horenstein wore over paint-splattered overalls. Maggie gave a soft laugh. "Burt never cared about clothing. And when he was in the academy, he was your typical penniless artist. He might have been the most talented student there, but he didn't really begin to sell his work until about five years after he got out of school." "I bet his work is worth a fortune now," Nancy said. "Absolutely," Maggie said. "Art always be comes more valuable when the artist dies. Since Burt's death, the prices on his paintings have skyrocketed. He'd be amazed if he knew what his paintings sell for now. Nancy sighed. "I guess I won't be buying Hannah a Horenstein. I sure would love to see more of them, though." "You're in luck," Maggie said, closing the photo album. "A week from today we're having a Horenstein retrospective here at the gallery. " She pointed to the stack of canvases leaning against the wall. "We'll have pieces spanning his entire career. You should both come to the opening." "I'll definitely be there," Nancy promised. "But right now I'm looking for a birthday present for Hannah." Maggie looked thoughtful. "I might have just the thing, but not until tomorrow. We're getting in a shipment of small paintings, mostly still lifes -- the sort that Hannah loves. Some of them are going to be very reasonably priced." "That sounds perfect," Nancy said. "I'll stop by sometime tomorrow and check them out." Nancy glanced at her watch as she and Bess left the gallery. "We still have some time before the softball game. Why don't we go back to my house and grab some snacks?" "A seriously excellent idea," Bess agreed, getting into Nancy's blue sports car. A short time later Nancy and Bess reached the Drew house. "It's awfully quiet here," Bess said as they went inside. "Where are your dad and Hannah?" "Hannah's visiting a friend, and Dad's at work," Nancy said. "Your dad's working on a Sunday?" "He's preparing a case that goes to trial tomorrow." Nancy's father, Carson Drew, was a well-known criminal lawyer. "Why don't you see what's in the fridge?" Nancy suggested. "I'll just check the answering machine. Seeing the message light flashing on the ma chine, Nancy pressed the Play button and waited as the tape rewound. "1 found some apples and some chips -- " Bess started to say as she came in from the kitchen. She stopped as they both heard a familiar voice. "Nancy, this is Dr. Ryan at River Heights High," the message began. "As in Principal Loretta Ryan?" Bess asked in disbelief. "Why would she call -- "
"I'm sorry to bother you at home on a Sunday," the principal went on in an agitated tone. "But I'd appreciate it if you could come over to the high school as soon as possible. I don't quite know how to describe it -- I don't actually know how it happened -- but a serious crime has been committed at River Heights High!"